Raise your hand if you took skating lessons as a child. And now think about the last time you were on the ice. Can you even remember it? Most of us put our skates in the back of the closet once the kids were out of the house. But for a group of older women in Canada, their passion for skating, and their need for an escape from their everyday lives, has led them to get out on the ice and pursue competition on a worldwide stage. And you can watch for yourselves in the new Canadian documentary To The Worlds, a film by 59-year-old freelance filmmaker Wendy Ord, one of the women skaters profiled in the film, as a part of the international Adult Skating Competition in Germany in 2018. 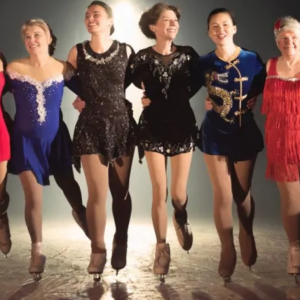 The film highlights the athletic prowess (and challenges) of these older women, who range in age from 46-77, and it also shines a light on the time, energy and emotion each put into their skating, not to mention the impact on their off-ice lives. Some are out there for the fun and comradery while others are passionate in their pursuit of a medal. So sharpen your blades and listen to a radio interview with these fierce and funny women here and read more about their inspiring journey to world competition here.